Q. What am I searching when I search Compass? Compass allows you to limit your searches to physical or electronic items in various ways. Follow these instructions to up your research game! Compass is what's known as a discovery tool - it's not quite an online catalog nor a database, but it can return results from both our library holdings (like a catalog), and from the vast majority of our databases. From the library's homepage, there are different ways to begin your searches of University of Denver resources depending on the nature of the item(s) that you wish to find. 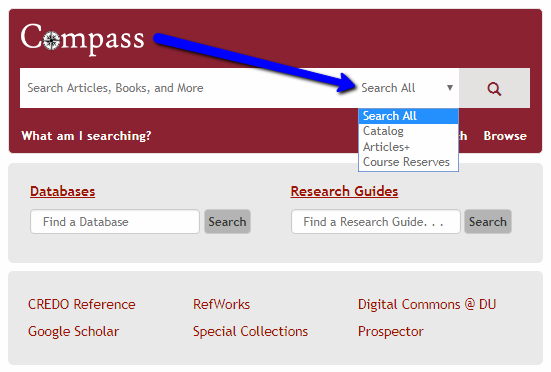 Before executing a search, choose carefully from the Compass drop-down menu among the options that appear: Search All, Catalog, Articles+, and Course Reserves. An explanation of these options appears below. All items in the Catalog (see below). All items in Articles + (see below). This is the broadest search possible using your University of Denver resources and the default search option. It's a good place to get your feet wet, but it may be inefficient for more targeted searching. There's a lot of stuff in here! It is important to note that the Catalog search will not search within journals and databases, but will look for publication titles. So you can search for "The Journal of Social Psychology" here, but shouldn't look for "university gender roles". If you want to search within databases or journals, try using the Articles+ tab, or opening the database or journal itself. Additional resources shared amongst other libraries also using our new system. Physical items that have been set aside for a specific class. Try running a regular search and then using the limiters along the right side of the screen to narrow down your search. Alternatively, you could begin from a Compass Advanced Search, selecting first from the four search options explained above and selecting second by "Material Type." Please ask the Research Center Desk if you have any questions!